The tool is available as an Eclipse plugin. Currently the plugin is available for the Eclipse Kepler SR2 packages. The following table lists the platforms supported with the platform specific plugin jar files that need to downloaded. The plugin requires a model database with API code examples and it downloads/upgrades the model database automatically. However, you can also download the model database manually, placing the downloaded file in the active workspace of your Eclipse IDE. To test the model download and unzip this project, and then import it into the Eclipse IDE. Download the Eclipse IDE (Eclipse Kepler release SR2 packages) and the required two jar files. Make sure that you download the correct jar files . Now, go to the plugins folder located inside your Eclipse installation folder. Remove the jar file whose name starts with org.eclipse.jdt.ui_. Now put the plugin jar files (downloaded in the previous step) inside the plugin folder and start Eclipse IDE. To verify that the plugin has been installed correctly, open the preference page of Eclipse IDE. If the installation is successful, you will see PARC Preferences menu on the left hand side of the window as shown in the following figure. 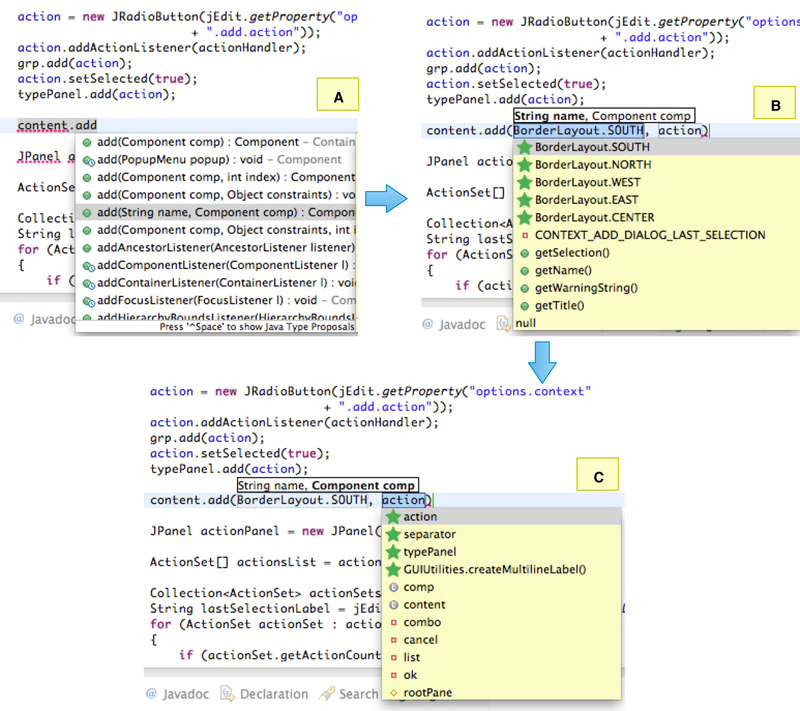 Allow Eclipse content assist inserts method parameters automatically on method completion. 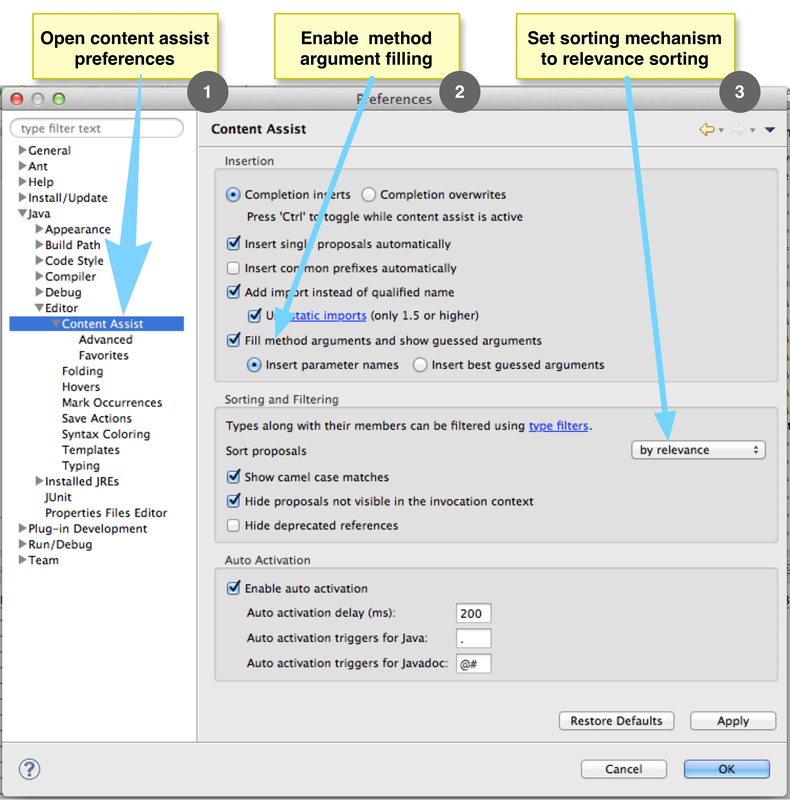 Open the preferences of your Eclipse IDE and go to the content assist preferences (Java > Editor > Content Assist). Enable method argument filling (see Fill method arguments and show guessed arguments checkbox). Next, enable sorting proposals by relevance (see Sort Proposals combobox). These are highlighted in the following figure. Import the previously downloaded project in the Eclipse IDE. To use PARC, type dot(.) after a receiver name to open a popup menu for method call completion and select the target method call by pressing enter key. 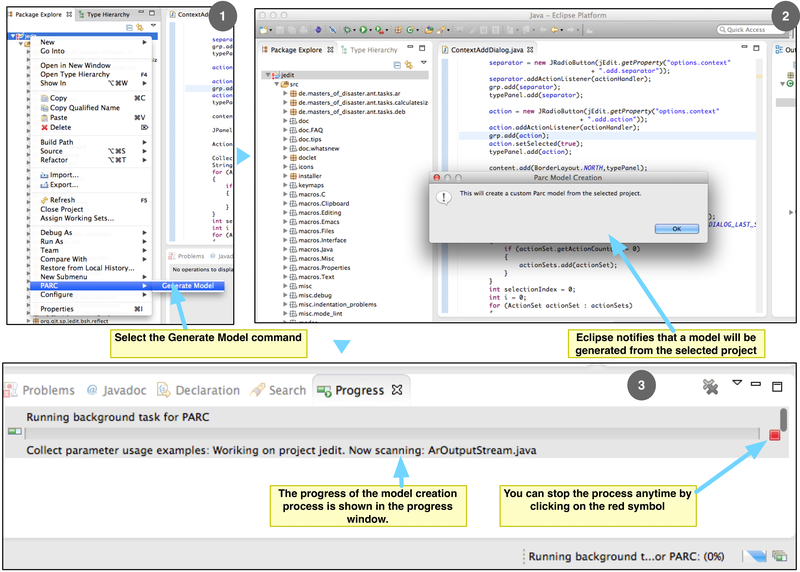 PARC will activate automatically and provide suggestions that are integrated with Eclipse JDT proposals. PARC leverages previous code examples to make recommendations. Thus, it requires a model database that contains those code examples. We are happy to inform you that a model database is already available for you that contains code examples for Java AWT and Swing libraries. This means that PARC can recommend method parameters for method calls of those libraries and we plan to update the database for you with more libraries. The database will be downloaded automatically during the first use of the PARC and will be updated automatically. If you face any difficulty, download the model file in your own computer and put that in your Eclipse workspace. For example, if Alice set the workspace of her Eclipse IDE to /Users/alice/Documents/alice_workspace, she needs to put the downloaded model file inside the alice_workspace folder. To learn more about workspace and switching workspace click here. The following figure shows an example of using the plugin. A developer requests for method call completion by pressing dot after typing the variable name (see part A of the figure). Eclipse shows the possible completion proposals through a popup menu. Developer selects the add method with String and Component parameter types. As soon as the developer makes the selection by pressing enter key, PARC activates and recommends completion proposals through another popup menu starting from the first parameter (see part B of the figure). The suggestions made my PARC are highlighted with a different icon. The developer can cycle through remaining parameters by pressing the tab key (see part C of the figure).